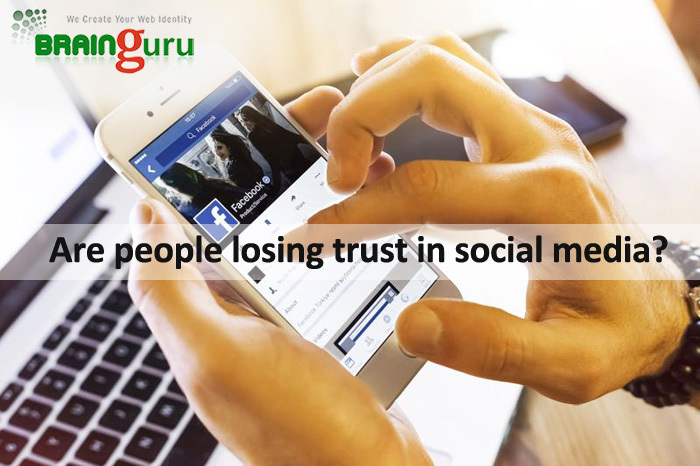 Are people losing trust in social media? | Brainguru Technologies Pvt Ltd.
Home / SMO Company in Noida / SMO Services / Are people losing trust in social media? Are people losing trust in social media? The 2018 edition of the Edelman Trust Barometer, released on Monday, measures the public's trust in four different institutions/ business (economic well-being), government (national security and public policy), media (information and knowledge) and NGOs (social causes and issues). The 2018 edition of the Edelman Trust Barometer was released on the Monday with disappointing results for the U.S. and social media platforms. The Edelman Trust Barometer measures the public's trust in four different institutions; business (economic well-being), government (national security and public policy), media (information and knowledge) and NGOs (social causes and issues). Edelman has been conducting these surveys in 28 different countries and have accumulated 18 years of data from over 33,000 respondents. This year's survey shows that media is now the least trusted institution globally, with 22 out of 28 countries claiming it is distrusted. The considerable drop is said to be primarily driven by the lack of faith in platforms, most of all, social media and search engines. For 63% of those asked could not tell apart good journalism from a respected media organisation from the fake news and rumours. As well as almost 70% of respondents were concerned about false information being exploited and used as a weapon. On a positive note, the Edelman Trust Barometer did show that although trust in platforms declines, the trust in journalism rebounds. From 2017 to 2018, journalism has gained 5 points. Overall, the report shows that the general public in 20 out of 28 countries are distrusters, especially in the US where the Barometer shows its steepest decline yet with a 23-point drop, placing US below Russia and South Africa on the index. The general public (18 years or over) in China however do not feel the same as China gains 7 points, placing it in the top few countries on all the indexes. These are the results from over 500 people being surveyed for approximately 30 minutes in US and China, whereas 200 were asked in the other countries.